Greens & beans is a healthy meal that is inexpensive and simple to prepare. I make my recipe as a soup a few times each winter and have been waiting for the right time to turn this comfort food into a pizza. It can be risky to take something that is already delicious and change it so that it works on a pizza. 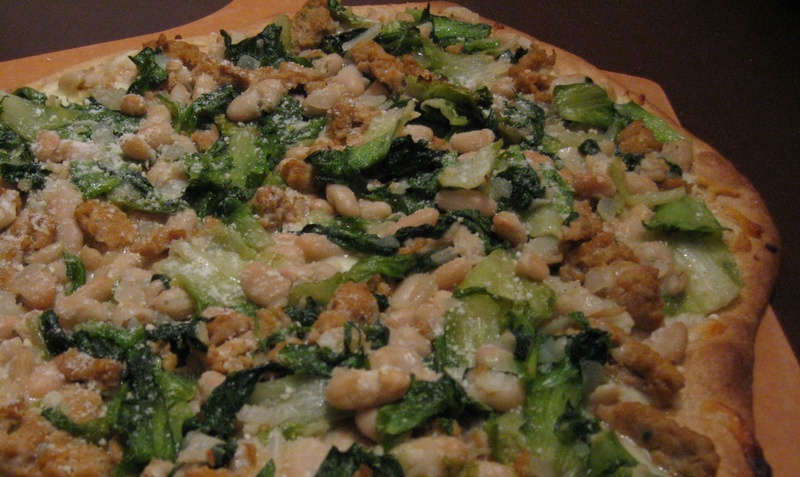 With my greens and beans pizza recipe I worried that it might be a bit dry, but it worked out great. Here’s how I put it together. I started by breaking up spicy Italian sausage with a potato masher in large pan on medium-high heat. In a separate pan, I sauteed a chopped white onion and garlic. Then I added escarole so it would wilt. To finish the preparation of the greens and beans I added cannellini beans and the cooked sausage to the pan. To create the pizza I put mozzarella cheese onto pre-baked dough and topped it with the greens and beans. Finally, I added a light sprinkle of parmesan cheese after I took it out of the oven. Next time I create this pizza I might try making it a vegan friendly pizza by leaving off the sausage and the cheese.